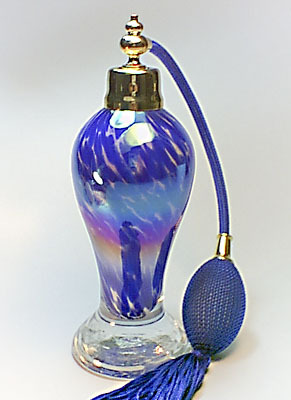 Material: Crystal glass made by hand and mouth blown. Size: 60 mm x 60 mm x 174 mm ( 1 inch = 25.4 mm ) Finished: Crystal glass with Cobalt / Opaque decor and rainbow color treated. Fits with gold/blue tassel spray mounting. Genuine brass collar attached. Feature: Perfume refillable. Unique and premium present for all occasions. Small funnel attached. Packed in colorful box.